Cuban state media say Communist Party leader Raul Castro is recovering from a hernia operation. State television said on its evening broadcast that the 86-year-old leader who stepped down as president last month was following Friday’s plane crash in Havana as he recovered from surgery. The report offered no further details on Castro’s health. State media also said Cuba would fly flags at half-staff during an official period of mourning lasting until Sunday night. Argentina’s Foreign Ministry says two of the South American nation’s citizens died in Friday’s crash of a passenger jet in Cuba. A ministry statement says Argentina is “deeply shaken” by the deaths. The flight operated by Cuban state-run airline Cubana de Aviacion had at least 110 people on board when it crashed near the Havana airport shortly after takeoff. Cubana had hired the aircraft from Mexican charter company Global Air. Authorities have not given an official death toll, but so far only three people are said to have survived. Cuban Communist Party newspaper Granma says the passengers were mostly Cubans plus five foreigners. A six-person Mexican crew was also on board. Official media in Cuba say all but five of the passengers on a jetliner that crashed with at least 110 people on board are Cubans. Communist Party newspaper Granma did not immediately give a nationality or nationalities for the five foreign passengers. A six-person crew from Mexico was among those on the plane Friday. A company in that country had rented the Boeing 737 to Cuban national airline Cubana de Aviacion. Cuba hosts nearly five million tourists a year, but visitors tend to travel by bus or car because of the difficulty of booking passage on domestic flights. Those are often booked months in advance, and schedules are unreliable and frequently marked by lengthy delays. Former flight attendant Ana Marlen Covarrubias says she knows nearly all the crew members for Mexican charter Global Air who were on a passenger jet that crashed in Cuba with at least 110 people on board. Flight 972 was operated by Cuba’s state-run airline, Cubana de Aviacion, on a charter plane hired from Global Air. It crashed Friday shortly after taking off from Havana’s international airport. Authorities have identified the captain, co-pilot, three flight attendants and a maintenance worker who were on the jet. Covarrubias spoke to The Associated Press outside Global Air’s offices in the Mexican capital. She said she left the company about 2½ years ago after working there for more than seven years. Mexican authorities say the Boeing 737-201 that crashed in Cuba on Friday was built in 1979. A statement from the country’s Transportation Department identifies the pilot and co-pilot as Capt. Jorge Luis Nunez Santos and first officer Miguel Angel Arreola Ramirez. It says the flight attendants were Maria Daniela Rios, Abigail Hernandez Garcia and Beatriz Limon. It adds that the plane was rented by Cuban state carrier Cubana de Aviacion from Aerolineas Damojh. That’s the legal name of a small charter company that also goes by Global Air. In November 2010 a Global Air flight originating in Mexico City made an emergency landing in Puerto Vallarta because its front landing gear did not deploy. The fire was quickly extinguished and none of the 104 people aboard were injured. That plane was a 737 first put into service in 1975. Residents living near the site of a plane crash in Cuba tell The Associated Press they saw at least some survivors being taken away in ambulances after an airliner with 113 people on board plummeted after takeoff from Havana’s international airport. A military officer who declined to provide his name to reporters says there appear to have been three survivors in critical condition from the Cubana flight. Other officials have declined to confirm that. The heavily damaged and burnt plane is lying in a field of yuca-root plants. The plane was rented by Cubana, and an employee of a small Mexican charter firm says the aircraft belongs to the company. Cuba’s state-run airline is notorious for its frequent delays and cancellations. 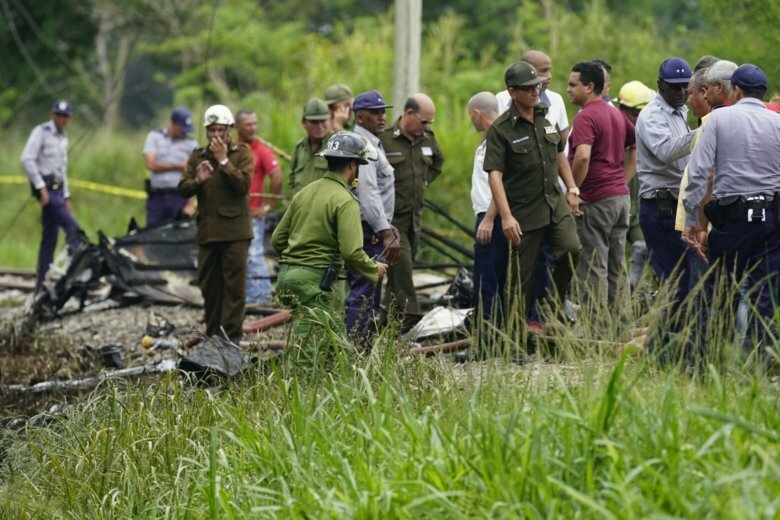 An employee of a small Mexican charter firm says the passenger jet that crashed near the Havana airport belongs to the company and that six Mexican crew members were operating it. An employee who answered the phone at the Mexico City office of Global Air said he had no information on the crew or the more than 100 passengers of various nationalities. The employee asked not to be named as the company is still not issuing formal statements. Websites offering the firm’s services say it flies to Cuba and operates several 737 planes. Founded in 1990, the company operates under the legal name Aerolineas Damojh, S.A. de C.V.
A military officer tells reporters that there appears to have been only three survivors in critical condition after a Boeing 737 crashed on takeoff from Jose Marti International Airport in Havana on Friday with 104 passengers and nine crew aboard. The officer declined to provide his name and other officials declined to confirm the figure. The plane came to rest in a yuca field where firefighters sprayed the charred fuselage with hoses. Officials said the plane was headed to the eastern city of Holguin when it crashed between the airport in southern Havana and the nearby town of Santiago de Las Vegas. The plane was operated by Cubana. The state airline has taken many of its aging planes out of service in recent months due to mechanical problems. The plane lay in a farm field and appeared heavily damaged and burnt, with firefighters spraying water on its smoldering remains. Government officials including President Miguel Diaz-Canel rushed to the site, along with a large number of emergency medical workers and ambulances. Residents of the rural area said they had seen some survivors being taken away in ambulances. The plane was rented by Cubana, which has taken many of its aging planes out of service in recent months due to mechanical problems.